There’s now a Page on this blog for things Zwicky (besides me): postings about people named Zwicky and things named Zwicky. 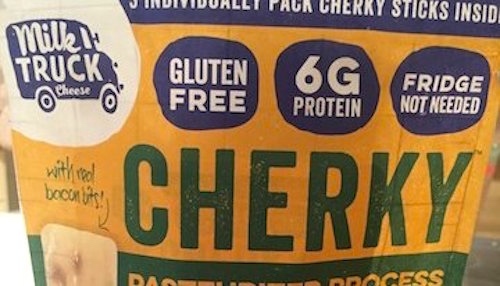 In recognition, an assortment of things not already posted: on museli, a fanciful derivation of the surname (on a t-shirt), a low-budget mystery film, a Quebec eco-activist, and a Zwicky cheese man who’s moved from America’s Dairyland to serving the Big Apple. The E. Zwicky AG mill has become the most important hulling mill of its kind in Switzerland over the 120 years since its foundation. The company is based in the north-east of Switzerland, in Müllheim-Wigoltingen in the canton of Thurgau. It was founded in 1892, is still family-owned and is now run by the forth generation. Try our varied range of muesli for a healthy breakfast and a healthy life: there are seven varieties to choose from made with a mix of different cereals, enriched with nuts, dried fruits, berries and many more delicious ingredients, available in our environmentally friendly no-fuss packaging and a vacuumized inner-bag. For the discerning gourmet and all those who love a full life with food full of goodness. 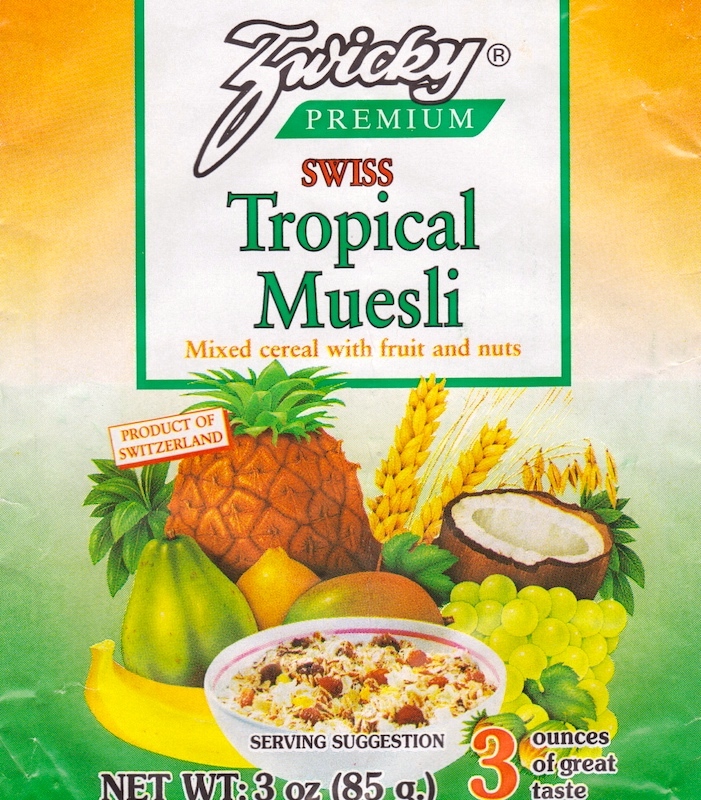 Varieties: original, with fruit, crunchy, tropical (illustrated above), chocolate, millet, crunchy spelt. 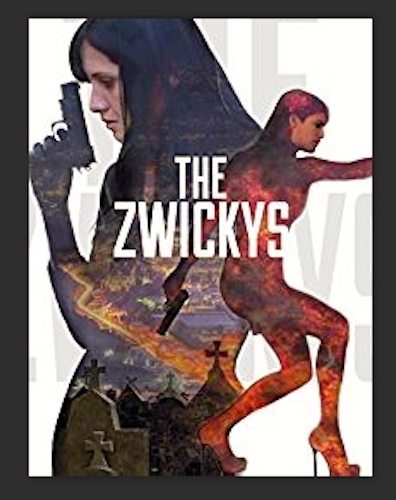 The Zwickys (2014): Newly widowed Kayden Zwicky sets out on a mission to find her husband’s killer and seek justice. Her journey soon begins to blur the line between justice and revenge. Starring: Silvana Arias, Melany Bennett, Mario Cimarro. Co Founder, Barron County Cheese, 2010 – 2015. Co founded, cheese packaging firm in Barron, Wisconsin, expanded customer and product base. Sold interest to largest customer . Founder and CEO/President (majority owner), Wisconsin Cheese Group, 1985 – 2007, Monroe, Wisconsin. Started company, expanded to $90 million revenue, leading producer of hispanic cheese in the U.S. sold company, and acted as adviser to new owners. Like I said, from Dairyland to the Big Apple — but always in cheese. Somebody put some Cherky on the grill for hungry Ben! More Zwickys, and a near-Zwicky, to come. This entry was posted on October 17, 2016 at 8:29 pm and is filed under Clothing, Language and food, Movies and tv, Names, Portmanteaus, Zwickys. You can follow any responses to this entry through the RSS 2.0 feed. You can leave a response, or trackback from your own site.